New to ARC? This intro sheet will be great as an introduction to using the 100 book challenge. Familiarize students with each reading level. Cute spring writing paper. Lined. Precept Project for the end of the novel "Wonder" by R.J. Palacio. Chevron Owl Binder Covers and Labels- EDITABLE!!! Binder covers and labels. All items are editable to fit your needs! End of the School Year Primary Writing Activities!! Fun end of the year writing activities. Students will reflect on their favorite memory or complete a "would you rather" writing activity. These cute penguin site words can be used in the classroom for kindergarten site word practice. The list contains all kindergarten level dolch site words for practice. Pink and Black polka dot poster to explain the RACE writing strategy to students. End of Year Awards for your Class!! These end of the year awards are perfect for any grade!Includes the following awards-Ray of Sunshine-Best Smile- Math Wiz-Most Athletic-Best Dressed-Best HandwritingPlus- Fully editable for your classroom! 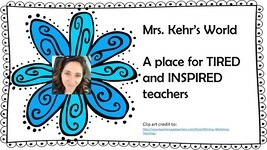 Ask Mrs Kehr's World a question. They will receive an automated email and will return to answer you as soon as possible. Please Login to ask your question.